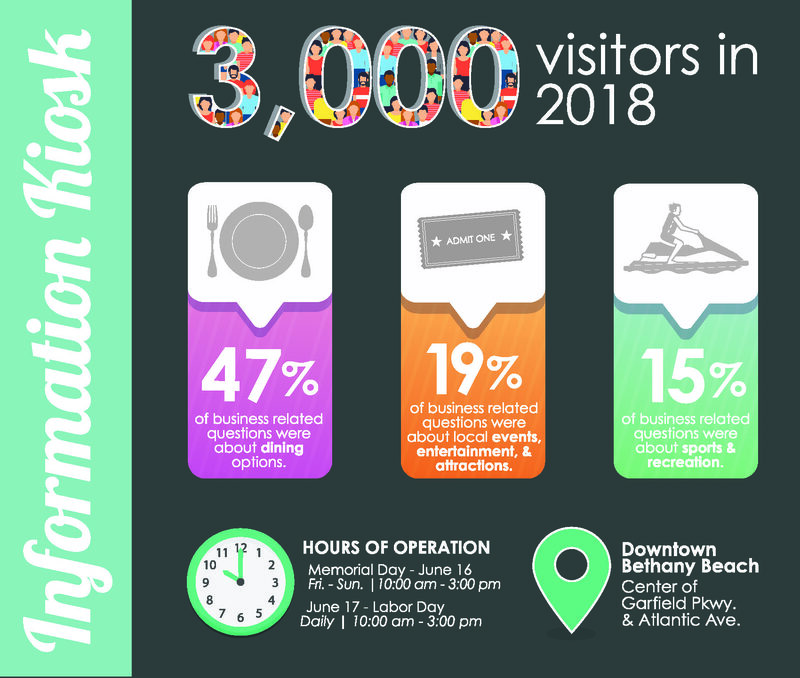 The Bethany Beach Information Kiosk, located in the Garfield Parkway horseshoe, prominently displays the Discover the Quiet Resorts Guide and Map which highlights Chamber member businesses. Additionally, all Chamber members have the opportunity to secure one of the twelve premium brochure spots for enhanced exposure. The premium brochure rack allows all rack cards to be fully visible to the visitors. The cost is $400 for the summer season. The kiosk will open Memorial Day weekend, operating on the weekends only until Father’s Day weekend. The kiosk will then be open daily through Labor Day. Businesses that wish to secure a premium brochure spot should contact Katie Nevin at 302-539-2100 x.111 or by email at katie@bethany-fenwick.org. The deadline to secure a spot is Friday, May 10th. Those who will be displaying their items in the kiosk will be asked to have a minimum of 100 rack cards ready for distribution in the kiosk by Friday, May 17th. Items can be mailed to the Chamber at 36913 Coastal Highway, Fenwick Island, or can be dropped off during bussiness hours. The kiosk is located in the Garfield Parkway Horseshoe in downtown Bethany Beach. $400 Premium Placement- Members can put one promotional piece (standard rack card size) in the Information Kiosk for the entire summer.